Making Waves youth reporter Jett Ballou-Crawford practices interviewing with fellow reporter Clarissa Curry. Top row from left: Delaney Tevis, Jett Ballou-Crawford, Clarissa Curry, Michaela Tucker and Kelsey Kupferer. Bottom row from left: Kathryn Fishman-Weaver, Sarah Freyermuth, Michele Yang. Radio can be a powerful medium for storytelling. Just ask a group of recent graduates from Columbia's Rock Bridge High School. In this episode of Thinking Out Loud, we hear a trio of young women's stories that explore how their identity was formed and who they want to be. 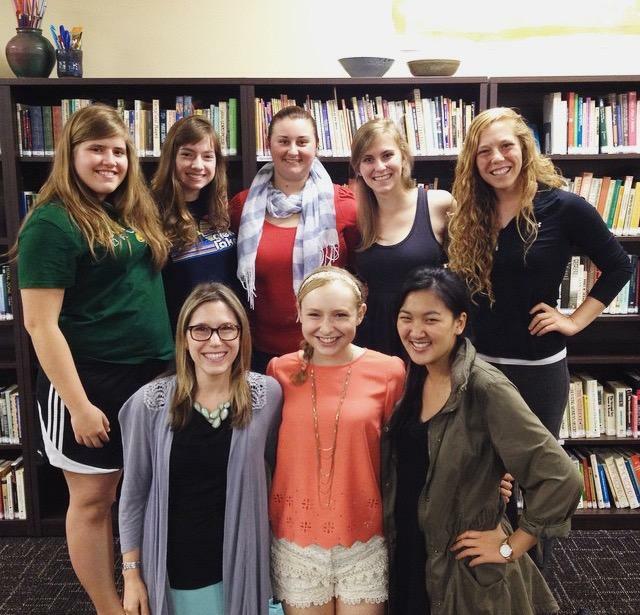 On this week's Thinking Out Loud Kelsey Kupferer leads a discussion about Making Waves. She and KBIA reporter Michaela Tucker started the project as a way to use radio production to help young people express themselves through storytelling. 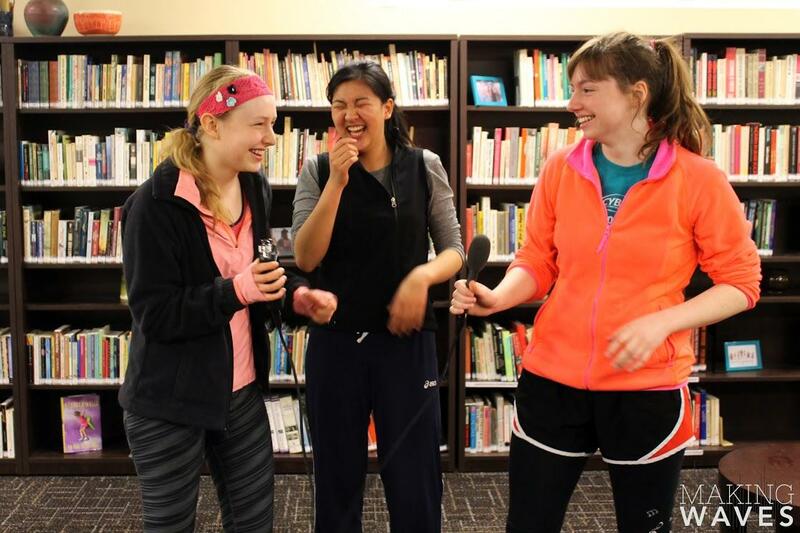 Sarah Freyermuth, Michele Yang and Jett Ballou-Crawford giggle as they practice interviewing each other with an audio recorder for the first time. Hear Sarah and others stories in this episode of KBIA's Thinking Out Loud. Making Waves is an educational youth radio initiative that empowers young people to share their true stories. 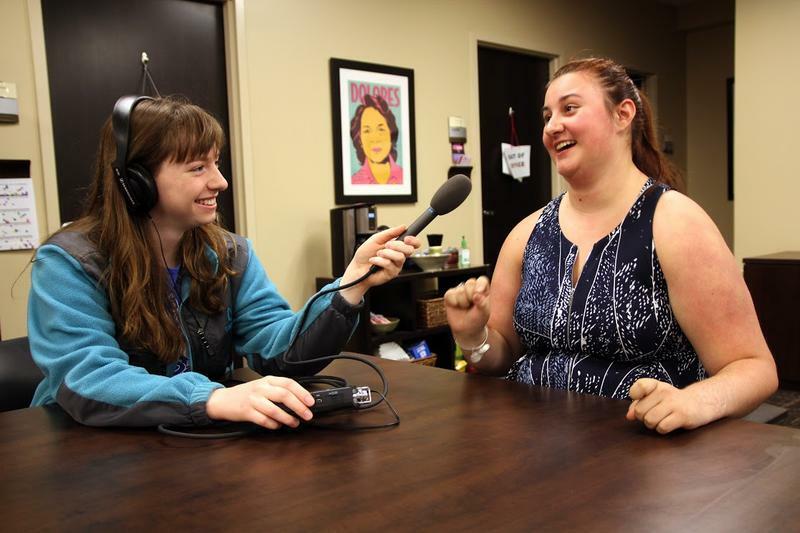 The program, started in February 2015 by University of Missouri students Kelsey Kupferer and Michaela Tucker, guides high school students through the process of creating radio journalism pieces about the social issues they care about. One of the things that I knew going into our research project that was important was vulnerability, and in particular looking at vulnerability in a new way. Oftentimes there’s a message that vulnerability and strength are incompatible. And our research team really wanted to provide a counter to that. We wanted to say that no, actually, there’s this concept that we’re putting forward called Strong Vulnerability. But how do you operationalize Strong Vulnerability? And that’s a complex question that I’m writing a dissertation on. But the short true answer is: with storytelling. And so in engaging in courageous stories like the stories that all the young women shared, we’re doing exactly that. We’re practicing Strong Vulnerability with the intention of making a difference around issues we care about. Making Waves provides students with a forum to share perspectives that are relevant to the community at large. The program encourages students to to explore the social issues that are important to them, and to understand how they can make a difference through objective storytelling. Making Waves youth reporter Sarah Freyermuth chose to report on misconceptions about eating disorders. She believes talking openly about eating disorders is the first step to fighting their stigmatization. I decided to talk about my struggle with anorexia, and the reason I decided to talk about that was twofold. First, talking about what I’ve been through, and what I’m still going through, helps me to deal with it and to process it. And second, I think one of the hardest things for me is that anorexia is really misunderstood. And so many people who go through it feel shamed into not talking about it. So if me telling my story makes them feel like, “Oh, hey, she doesn’t feel ashamed of talking about it, I shouldn’t feel ashamed of talking about it, there’s nothing to be ashamed of,” then my story will have accomplished its goal. Listen to Sarah's story 'The Blame Game' here. Making Waves youth reporter Clarissa Curry is headed to college in the fall to study engineering. She reported on the low percentage of women in engineering and the physical sciences. In the fall I plan to double major in electrical and biomedical engineering. And electrical engineering, despite having one of the lowest wage gaps in the United States, also has one of the lowest percentages of women. And, you know, I’m not necessarily worried about working with men, but I think it’s something that needs to be discussed because there’s no reason that there shouldn’t be more women. Women aren’t incapable of doing the math or the science or the engineering that’s behind the field. So, why are there less women? It’s something I’m really passionate about. Listen here to 'Encouraging Women In Stem' here. Youth reporter Delaney Tevis is also passionate about women in the workplace. Delaney settled on her story when she learned women outperform men academically from elementary school to graduate school, but only 3 percent of Fortune 1000 companies have a woman CEO. I think a problem for me was picking what I wanted to talk about because I am passionate about a lot of things in terms of social justice and things that I wish people talked about more. I started out with this broad idea of feminism, and then I realized more specifically within the umbrella of feminism was the lack of women in professional leadership positions. It’s really frustrating because women are putting in the work, and we have the data that shows it, yet somehow women still aren’t getting the top positions. So I zoned in and I was like, “This is the story I want to do.” And I started brainstorming about who I wanted to interview, and it all came together. I’m really happy with the way it turned out. Listen to Delaney's story 'The Gender Leadership Gap' here. Making Waves is a semester-long program. It will start up again in August with a new group of students. To hear all of the stories produced by Making Waves Youth Radio Initiative, and to learn more about the program, visit their website, makingwavescomo.org. You can also find them on Facebook and on Twitter at @MWYRI. This I believe. These are iconic words we heard on National Public Radio from the mouths of hundreds of people, sharing their beliefs, thoughts, and guiding principles. Today KBIA brings you a series of This I Believe, written and recorded by Rock Bridge High School students.